The main material MU Form works with is high quality bent ply, which is one of the most widely used materials in this industry due to its ability to create a variety of shapes for chairs, stools and tables. The company’s specialists seek to create great designs that pose a challenge for other manufacturers to copy or replicate. To produce a new original piece of furniture, MU Form would normally ship a physical prototype model to a factory overseas so they reverse engineer the model by using a router duplicator to create a wood mold. 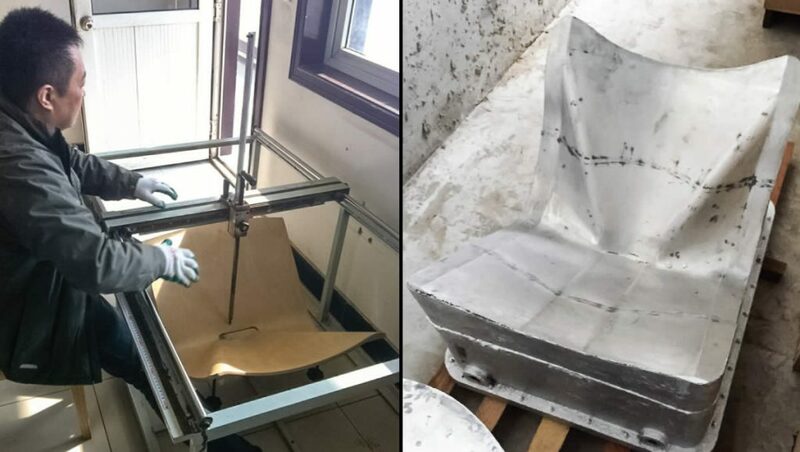 “While this method worked to get us started in making a somewhat accurate representation of the chair or stool prototype, it didn’t allow us to efficiently fine-tune some of the curvatures and surfaces that we knew needed to be fixed for the final production furniture,” says Mark. The company has recently started to outsource 3D modeling services to Artec’s office in Palo Alto, CA. This is what the workflow is like now: the furniture designer develops the physical prototype of a furniture piece. To reverse engineer the piece, the prototype is 3D scanned with Artec Eva. The raw point data is then used to create contours in Rhino 3D, in particular to accurately model every nuance in curvatures and radii. The chair is wood with a matte finish, and some grain lines helped the Artec Eva stay on track. I captured the front, back, edges and handle in separate scans, then snapped them together with the align tool. Mark says that he is most excited about precision: “The precision of reverse-engineering the prototypes and having the ability to fine-tune digital models allows us to move toward a totally new level of quality and consistency for our furniture.” Mark adds that MU Form plans to continue working with Artec to make other furniture pieces, including tables, chaise lounges, and other larger pieces. The use of Artec 3D scanners has helped MU Form significantly increase the quality and consistency of their furniture, while at the same time boosting productivity, saving development time and reducing development and production costs. The time frame for creating a mold has been slashed from 60—90 days to 20 days, and savings are estimated to reach 10—15%.